This story was updated at 2:09 a.m. ET, May 24. HOUSTON — A Russian Soyuz space capsule has landed safely on Earth, returning three veteran spaceflyers home after a five-month mission to the International Space Station. It was a calm, sunny Tuesday afternoon at the central Asian landing site, with the three spaceflyers wearing broad smiles after emerging from their spacecraft and breathing fresh air for the first time in 157 days. All three were reportedly in good health and spirits following the landing. 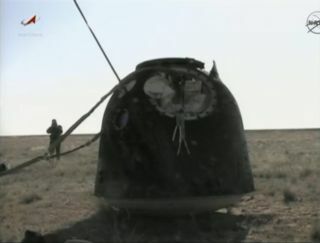 NASA officials said the Soyuz landed upright instead of tilting over its side due to winds in a rare, smooth touchdown. "Right now, the station crew is on helicopters," space station flight director Dana Weigel said in a news briefing early Tuesday (May 24). "Paolo and Cady will get on a NASA plane and head back to Houston, and Dmitry will go back to Star City, [Russia]." The trio undocked from the space station at 5:35 p.m. EDT (2135 GMT), leaving behind three crewmates – NASA astronaut Ron Garan and Russian cosmonauts Andrey Borisenko and Alexander Samokutyaev – and six visiting astronauts from NASA's shuttle Endeavour. "Ron, it's all yours," Nespoli radioed to Garan as the Soyuz backed away from the space station. This was the first time that a Soyuz undocked from the space station while one of NASA's space shuttles was also attached to the orbiting laboratory. To mark the occasion, the departing astronauts conducted a special photo opportunity of Endeavour and the station. "Is it beautiful?" one of the Soyuz crewmembers asked about the view. "It's very nice," Nespoli responded. The only other time a space shuttle was photographed at a space station was when the shuttle Atlantis was snapped while undocking from the Russian Mir space station on July 4, 1995 near the end of its STS-71 mission, said NASA spokesman Rob Navias. "It was fantastic to watch it," Weigel said, "It was pretty amazing. Dmitry's piloting skills were spot on. It was like watching something we had done multiple times or had trained on the ground. From a smoothness of execution, I could not have been happier. I think we're going to get a lot of fantastic images from it." "This is the first time we've ever done something like this," lead shuttle flight director Derek Hassman told reporters earlier today. "It's unprecedented and we've worked hard to get here. From a big picture perspective, it demonstrates the partnership we have with our Russian colleagues and the things we can accomplish when we work together." Prior to the Soyuz undocking, an issue was detected with an electrical box that is used to house data from onboard payloads, store digital imagery and send files between the station and the ground. Garan worked later than expected to work on the cables, and when the shuttle crew woke up that evening, they replaced the box to resolve the issue. About five or six hours of data were lost as a result, Weigel said, and payloads throughout the station were affected. To compensate for Garan's extra work, mission managers allotted an extra three hours of sleep for the station resident. Once the issue was resolved, the main focus reverted back to the undocking operations for the three returning astronauts. Kondratyev, Coleman and Nespoli launched to the International Space Station on Dec. 15, 2010. They arrived at the orbiting outpost two days later. During their time on orbit, Kondratyev, Coleman and Nespoli oversaw the last visits of two space shuttles – Discovery's final STS-133 mission in February, and Endeavour's STS-134 finale, which docked at the station last week on May 18. Nespoli suffered a family tragedy during his stay on the station. Earlier this month, his 78-year-old mother Maria Motta died of illness while he was living aboard the space station. Today's departure leaves Garan, Samokutyaev and Borisenko aboard the station to host Endeavour's crew until they undock from the orbiting laboratory on May 29. After that, the space station will be home to only three astronauts until the arrival of three new space station crewmembers in June. Russian cosmonaut Sergei Volkov, NASA astronaut Mike Fossum and Japanese astronaut Satoshi Furukawa are scheduled to launch into orbit on June 7. They are slated to arrive at the space station two days later. Prior to his departure, outgoing station commander Kondratyev turned command of the outpost over to fellow Russian cosmonaut Borisenko, who will preside over the station's Expedition 28. The arrival of Volkov, Fossum and Furukawa will round out the new expedition's crew.